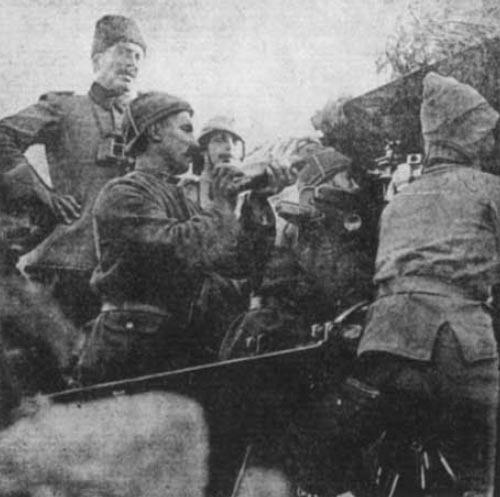 Turkish field artillery on the Gallipoli front. Gallipoli – Anzac bridgehead: Turk shells cause 262 casulaties at Lone Pine. Kitchener in Paris. Sir J French in London sees Asquith but does not take hint to resign, fears friction with King if he becomes C-in-C Home Forces. Despite Misic’s pleading for drive to Greece and Allies and news of Germany withdrawing 6 divisions, Serb Army commanders in conferences at Pec (and on December 1) keep to Albanian retreat, preparations too advanced. Italian Front: Italian Second Army finally takes Oslavia ridge. Black Sea: Minelayer sub UC13 runs aground and has to be aban­doned. Sweden: ­Belligerent submarines barred from territorial waters save in emergency on surface with flag.